DJ Shadow opens up about his new record. In 1996, DJ Shadow changed the face of electronic-music culture with Endtroducing. Made entirely from sequencing snippets lifted from other records, the album inspired a whole new generation of music makers and DJs working in downtempo, hip-hop and turntablism. Since then, Shadow, 38-year-old Josh Davis, has remained one of abstract hip-hop’s more thoughtful minds and one of the world’s most talented DJs, even if subsequent releases haven’t lived up to the hype of his debut. With an as-of-yet unnamed record due out early this year and a International tour under way, the Davis, California, native took time out from sound checking at a gig in New Mexico to speak to us on the phone about his new LP and how technology has (and has not) changed deejaying. You refer to your new album as a return to form. Listening to the first two singles, I have to agree. That has to do with two things. One is that for the first time since The Private Press I allowed myself the immersive work environment that my music needs. Having recently gone through six months of that, I realize that it’s essential that I find that. On [The Outsider] I couldn’t achieve it because I had two newborns. I don’t regret my work habits on the last record, but I think I was ready to do another heavy, deep album. The other component of why I feel this new record is a return to form is because there are no collaborations. It’s 100 percent me. Those two factors have led me to making music that is my preferred mode and the mode that generates the best work from me. Were you digging heavily for psych records on this new one? My greatest period for wide-eyed growth in that department was actually around the mid to late ’90s. I’m not the type of person that’s like “been there, done that.” Once I love a type of music, it’s with me permanently, whether it’s Miami bass or hyphy or funk or whatever. That said, is your present sound still influenced by what you’re digging up? Very much so. If anything, I would say one thing that I was digesting a lot of, by nature of the fact that I was working in a one-bedroom cottage in the rural outback of California, was a lot of rural folk and country. That’s an influence that I wouldn’t have normally been receptive to ten years ago. 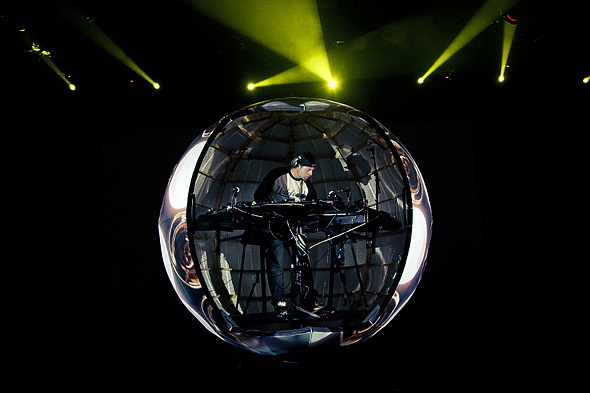 DJ Shadow Highlight Reel from Tribeca Flashpoint on Vimeo.